Studies on large and rapid mass movements have become a challenging issue in relation to paraglacial and morpho-tectonic evolution of mountain slopes. Rockfalls, rockslides and rock avalanches will be considered here on the basis of selected sites in the French and Swiss Alps and in the Himalayas. The main topics developed relate firstly to the modes of emplacement of, and the internal structures observed in, the body of the runout deposits and the influence of the surface (bedrock, superficial deposits, glacier, lake) over which the propagation takes place. The impacts of these rockslope failures on geomorphic systems (damming effects, storage, control on sediment fluxes) are then considered. Finally, the possible influence of climate change on high-alpine rockwalls, and potential threat to adjacent inhabited areas, are presented. Les études sur les grands mouvements de terrain sont devenues un sujet de débat important en relation avec l’évolution morphotectonique et paraglaciaire des grands versants montagneux. Seront considérés ici les écroulements rocheux, les glissements rocheux et les avalanches rocheuses à partir de quelques sites emblématiques des Alpes françaises et suisses ainsi que de l’Himalaya. Les principaux thèmes abordés sont ceux des modalités de mise en place des dépôts associés à ces mouvements de masse et l’étude de leurs structures internes, ainsi que l’influence que peut avoir la nature de la surface (substrat rocheux, formations superficielles, glaciers, lac) sur laquelle ces matériaux s’étalent. Les impacts des grands mouvements de masse rocheux sur les systèmes géomorphologiques sont ensuite étudiés (barrages, rétention de sédiments et contrôle des flux sédimentaires), avant de discuter de l’influence possible des changements climatiques sur les hautes parois alpines et la menace qu’ils font peser sur les zones habitées voisines. Thoughtful reviews and English editing by anonymous referees have improved the manuscript and are gratefully appreciated. We thank J.-C. Thouret for his constructive comments on the final manuscript. 1Until recently most landslide research in France was carried out with structural geological or geotechnical concerns in mind. Yet, the geomorphological approach played an increasing part in this research (Flageollet, 1988). A few studies on large and rapid mass movements and their associated deposits were developed in various places in the Alps and in high mountains worldwide (Deline, 2001, 2008; Cossart et al., 2008; Fort, 1987, 2000; Fort and Peulvast, 1995; Schoeneich, 2000; Wassmer et al., 2004). These studies followed a direction that has become a challenging issue in the international literature (Evans and DeGraff, 2002; Hewitt et al., 2008). There are at least three reasons underpinning our recent focus on large (> 0.5 x 106m3), rapid, and catastrophic rock slope failures. Firstly, they are considered as one of the modalities of “orogenic erosion”, in which rock deformation and surface processes interplay to shape the present mountain landscapes (Burbank et al., 1996; Willett, 1999; Montgomery, 2001; Hovius and Stark, 2006; Korup et al., 2007). Secondly, these failures may result from glacial unloading, an efficient parameter to reactivating pre-existing discontinuities and modifying the stress distribution in glacially, oversteepened slopes; this is the “debuttressing effect” (Evans and Clague, 1994) or paraglacial readjustment (Ballantyne, 2002). Thirdly, the growing concern with climate change involves it as a potential, yet complex determining cause of slope instability, with the interaction, at mountain slope scale, of deglaciated, debuttressed slopes, together with permafrost thawing and/or increased rainfall (Evans and Clague, 1994; Soldati et al., 2004). 2In this article we discuss several distinctive, large mass movements and their deposits studied by French (and other) geomorphologists. After a short introduction to terminology and a presentation of the selected sites, we shall focus on three main topics: (i) the modes of emplacement and internal structures observed in the body of the runout deposits, and the interaction of the bedrock surface with the flow propagation; (ii) the impacts of these rockslope failures on geomorphic systems (damming effects, storage, and control on sediment fluxes); and (iii) the possible influence of climate change in high-alpine rockwalls, and threat to adjacent inhabited areas. 3Large and rapid rock slope failures generally occur in areas of high relief, and may affect the different parts of a mountain slope. Different types of processes may be distinguished, according to the volume of displaced material, and the nature and extent of the debris spreading area, or runout (Cruden and Varnes, 1996). We shall consider rockfall, rockslides and rock avalanches, briefly defined as follows. 4Rockfalls,a common process affecting steep slopes,correspond to the detachment of rock clasts or blocks that descend freely through the air. The detachment occurs generally along a surface on which little or no shear displacement takes place, along preexisting discontinuities or tension failure surfaces. Governed by gravity, this process often results in the breaking up of clasts, and may also involve fluidisation, cohesionless and grainflow (Dikau et al., 1996). A rockslidecorresponds to the downslope movement of a failed rockslope, occurring predominantly on surfaces of rupture that are either planar, listric or bi-planar; more rarely, circular. A rockslide can be extremely rapid, leading to a rock avalanche, or very slow, progressively deforming the slope. In its distal part, it may evolve as a flow (earth flow or debris flow), the toe area of which may deform in a complex way (creeping, bulging, overriding of preexisting landforms) and may be catastrophic in its effects (Dikau et al., 1996). 5A rock avalanche is a high-magnitude process, triggered by a massive rock slope failure and steep descent of valley walls of some hundred of metres at least, the runout of which is known to increase with its volume (Hsü, 1975; Hewitt et al., 2008). These extremely rapid (> 25 m.s-1), large (> 1 x 106 m3) mass movements, also referred to as sturzstrom (Heim, 1932), are potentially very destructive, but evidence of former rock avalanches is often ignored because of their low frequency, and deposits that are easily mistaken for other similar, glacial ones (Hewitt, 2002; Fort, 2000; Hewitt, 2009). For more than 120 years, several hypotheses have been proposed to explain the capacity of huge mass movements to travel long distances. Conditions during the early stage of movement, or the sliding rate distribution within the moving mass, differ between failures along inclined bedding planes as in sedimentary rocks or on stratovolcanoes slopes, compared to failure surface cutting across bedding planes or other boundaries between geological units, or in rocks with no regular system of pre-existing potential sliding surfaces (Strom, 2002). In fact, many studies propose that the friction reduction mechanism at the base or within the moving mass is responsible for the long travel distance, and that it could be of various origins (Davies, 1982; Cruden and Hungr, 1986; Davies et al., 1999). Another parameter influencing the nature of debris is the interaction with substrate material, including formerly deposited till, lacustrine, or glacio-fluvial sediment (Schoeneich, 2000; Wassmer et al., 2004; Poschinger et al., 2006) and, as described below, with the rock avalanches occurring in high mountain glacier basins (Hewitt, 1988; Hewitt et al., 2008; Deline, 2008). 6Four case studies were chosen to illustrate the role of different geomorphic settings, and spatial and time frames (fig. 1). Present-day instabilities are mostly documented in the French and Swiss-Austrian, high alpine zone, whereas older historic or prehistoric instabilities are from diverse geographical areas. Fig. 1 – The Alps. Fig. 1 – Les Alpes. Location of six case studies in the Alps. 1: Flims; 2: Mont Granier; 3: Tauredunum; 4: Mont Blanc massif; 5: Vanoise massif ;6: Vallouise. Localisation des sites étudiés dans les Alpes. 1 : Flims ; 2 : Mont Granier ; 3 : Tauredunum ; 4 : massif du Mont Blanc ; 5 : massif de la Vanoise ; 6 : Vallouise. 7The Dhumpu-Chooya rock avalanche (Nepal Himalaya) is one of the many large rock failures (>1 km3) that have been documented in the entire Himalaya-Karakoram Range in the last twenty years (Fort, 1987; Fort and Peulvast 1995; Hewitt, 1988, 2006, 2009; Hewitt et al., 2008). It is quite representative of the interactions between slope instabilities, rock structure and morphostructures, and can be considered as a formative event still influencing the overall “fragmented” (sensu Hewitt, 2002) morphology of the upper Kali Gandaki Valley floor. The Flims rockslide, located in the upper Rhine valley (fig. 1, site 1), is the largest rockslide known in the Alps, with an estimated volume of 12 km3. It resulted from a pre-historic high-speed movement of a large limestone mass, which dammed the formerly glaciated Rhine River U-shaped valley. Recent work carried out along the outcrops of the 400m deep Swiss Canyon incised into the body of the deposits provides new insights into the kinematics and disintegration of the rockslide mass and its effects on adjacent valleys (Wassmer et al., 2004; Pollet et al., 2005). The Mont Granier collapse-landslide is a singular event that occurred in AD 1248 in the northeastern end of the Subalpine Chartreuse massif. It is one of the largest historical rockslope failures known in Europe (fig. 1, site 2). It caused many casualties, although the numbers are still debated (Nicoud et al., 1999). The historical Tauredunum rockfall (AD 563), located in the upstream part of the Geneva lake (fig. 1, site 3), is interesting for its different, indirect effects, and also for hazard assessment. It shows that in particular situations involving rockfall onto fine-grained, water saturated, unconsolidated sediments, rockfall impacts can lead to complex processes that are much more devastating than the simple spreading of the rock mass. In the glacierized Mont Blanc, Vanoise and Écrins Alpine massifs, “small” (104-105 m3) rock avalanches are quite common due to high elevation and steep rock slopes (fig. 1, sites 4, 5, and 6). The glacial deepening during the Last Glacial Maximum and the resulting rock-slope steepening may induce paraglacial adjustments, which destabilise high-altitude rockwalls by increasing the internal stresses of the rock mass (Ballantyne, 2002). They are a potential threat to the surrounding valleys and plains, where urbanisation, major transport axis, and intense tourism increase the population and infrastructures that could be reached by rock avalanches. 8As pointed out by several authors (Hewitt, 2002; Strom, 2002; Evans et al., 2006), the modes of emplacement of the runout deposits depend on the overall geological context, on the pre-existing morphology of the mountain valleys, and on the surface type (bedrock, glacier, or alluvial or lacustrine sediments), over which the runout takes place. Here we first consider the size of the landslide and the morphology, confined or unconfined, of the valley. 9At the scale of a mountain belt like the Himalaya-Karakorum Range, large rockslope failures have long been recognized as “formative events” that have persistent impacts on the morphology of mountain valleys (Brunsden and Jones, 1984; Fort, 1987; Fort and Peulvast, 1995; Schramm et al., 1998; Hewitt, 2002, 2006). Their occurrence is favoured by several predisposing factors including the greatest relief on earth, Quaternary glacial legacy, ongoing seismo-tectonic activity, and orographically enhanced precipitation. 10The Kali Gandaki valley (2000 m a.s.l.) cuts right across the Dhaulagiri I (8167 m a.s.l) and Annapurna I (8091 m a.s.l) massifs (fig. 2A). The valley has been obstructed by the large Dhampu-Chooya rockslide-avalanche (>1 km3, 10 km2) downstream of the Lete-Kalopani debris fan for many thousand years (Fort, 2000). The emplacement of the Dhampu-Chooya rockslide (recently referred to as “Kalopani” rockslide: Weidinger, 2006) was favoured by several predisposing factors: (i) it is located in the zone of maximum uplift rate within the crustal-scale ramp of the greater Himalaya (6-8 mm/yr; Bilham et al., 1997); (ii) the general northward (40-45°) dip of the Himalayan crystalline series favours “banc-sur-banc” planar slides; (iii) it is close to the South Tibetan Fault (or North Himalayan Detachment Fault), a shear zone at the contact between the “Himalayan Crystalline” and the “Tibetan sediments” prone to collapse tectonics. The local relief typically exceeds 3500 m. The rock avalanche has been identified on the basis of morphological, sedimentary and petrographic evidence of associated runout (Fort, 2000). The apparent thickness of the deposit is locally >250 m, as observed along the left bank of the Kali Gandaki (fig. 2C). This section displays a sharp contrast between the surface of the accumulation (rubble, with gneissic blocks several tons in weight) and the underlying layers, consisting of intensely fractured and deformed gneissic material, crushed at depth. The high percentage of fine particles is additional evidence for the crushing and pulverising of gneisses during the “en masse” displacement. The source of the giant rockslide is revealed indirectly by two arguments: (i) the relative low elevation of the Kaiku ridge (3300-3845 m a.s.l) compared to the one immediately to the south (4000-4578 m a.s.l. ); (ii) the “clean”, rocky gneissic slabs devoid of any regolith and vegetal cover in the upper Kaiku slope. Clearly, the Dhampu-Chooya rock avalanche can be interpreted as the result of the collapse of the top of this Kaiku ridge (Fort, 2000). Fig. 2 – The Dhampu-Chooya Rock-avalanche, viewed from the east slope (4800 m) of the Dhaulagiri Peak (8167 m). Fig. 2 – L’avalanche rocheuse de Dhampu-Chooya, vue depuis le flanc est (4800 m) du Dhaulagiri (8167 m). Note the sharp bend of the Kali Gandaki river, flowing from north (left) to south (right); A: The Dhampu rockslide/rock avalanche runout, covered by forest (middle of the photograph), was a barrier efficient enough to dam the Kali Gandaki valley and allow a large lake to develop more than 30 km upstream of the dam; B: Lacustrine deposits of Marpha, nearly 200 m thick; C: Section of the Dhampu rock-avalanche runout, as displayed on the left bank of the Kali Gandaki. Fractured gneisses are still recognizable in the upper part, whereas the lower part is mostly crushed bedrock. Noter le coude marqué de la rivière Kali Gandaki, qui s’écoule du nord (à gauche) au sud (droite). A : La masse glissée de l’avalanche rocheuse de Dhampu, couverte par la forêt de conifères (plan médian), a fonctionné comme un barrage suffisamment efficace pour bloquer la vallée de la Kali Gandaki et favoriser la formation d’un immense lac sur plus de 30 kilomètres en amont du barrage ; B : Dépôts lacustres de Marpha, épais de près de 200 m ; C : Coupe à travers la masse éboulée de l’avalanche rocheuse, visible en rive gauche de la vallée de la Kali Gandaki. Les gneiss fracturés sont encore reconnaissables dans la partie supérieure de la coupe, alors que la partie inférieure est principalement composée de roches broyées. 11The age of this giant slope failure is poorly constrained; it seems that it occurred after a major, older glaciation and before a younger one, more limited in space (Fort, 2000). An additional element is provided by the remains of the large (>30 km long; ca 200 m thick) Marpha lake (Fort, 2000), that developed upstream of the Kali Gandaki valley possibly in response to this large dam (fig. 2B); yet, additional blockage by glaciers descended from Dhaulagiri and Nilgiri peaks cannot be ruled out. The dating of the Marpha lacustrine series suggests the impoundment episode persisted between 56 ± 6.95 ka and 33 ± 3.4 ka (OSL dates: Baade et al., 1998). Recent exposure ages measured from the largest, isolated boulders found on the terrace overlooking the rock avalanche deposit yielded consistent ages of 27.3 ± 3.0, 25.9 ± 2.7 and 28.2 ± 2.9 ka 10Be, but other boulders clustered close to the Kali Gandaki River gave much younger exposure ages of≈ 4.1 ± 0.6 ka 10Be (Zech et al., 2009). These chronological benchmarks do not prove or preclude a paraglacial readjustment: they rather emphasize the geotectonically active context (Fort et al., 1982; Hurtado et al., 2001) favourable to the occurrence of unpredictable large rock slope failures and their later reactivation, independently of any climate forcing. 12The Flims sturzstrom (fig. 1, site 1) (Heim, 1932) occurred during the early Holocene (between ca 9500 and 9000 cal BP, according to Poschinger and Haas, 1997). The origin of the movement can be related to the structural predisposition of limestones dipping towards the valley, and dissolution fracture network. However, isostatic rebound following glacier retreat could have induced tremors that initiated the slope failure (Wassmer et al., 2004). The Flims rockslide-avalanche is a good example of how the internal structure provides a key to better understanding the rockslide-avalanches long runout. The Flims event involved 12 km3 of Mesozoic limestone. The deposits formed a large dam about 10 km in length (~20 km2) along the upper Rhine Valley and reaching a thickness of 400 m (Poschinger et al., 2006). The final draining of the impounded valley led to a complete incision of the deposits, hence allowing a three dimensional study of the internal structure along the walls of the Rhine River valley and its tributary canyons (fig. 3A and 3B). Fig. 3 – Flims rock avalanche. Fig. 3 – Avalanche rocheuse de Flims. A: The Flims Sturzström in the upper Rhine valley, with the palaeo-lake Ilanz; 1: extent of Ilanz lake; 2: rock avalanche deposits; 3: lacustrine sediments on rock avalanche deposits; 4: current hydrographic network;B: extent of the Flims Sturzström deposits; 1: lake; 2: fluvial-lacustrine deposits; 3: sturzstrom deposits; 4: scar’s outline; 5: contour line; C: Initial stage, a thick mass of sedimentary rocks displaying bedding planes and vertical joints begins to slide; D: The movement is initiated, an intense friction at the base and vibration of the sliding rocks induces thinning of the whole mass along weakness surfaces that correspond to bedding planes; E: Each slab moves as an independent unit. Clasts limited by S2 surfaces are tilted like books on a bookshelf. At the top, the absence of confinement induces an anisotropic dispersive inflation that leads to a complex fragmented flow. A : L’avalanche rocheuse de Flims, dans la vallée du Rhin supérieur, et le paléo-lac d’Ilanz; 1 : extension du lac Ilanz ; 2 : dépôt de l’avalanche rocheuse ; 3 : extension du lac sur les dépôts d’écroulement ; 4 : réseau hydrographique actuel ; B : Extension des dépôts de l’avalanche rocheuse de Flims ;1 : lac ; 2 : dépôts fluvio-lacustres ; 3 : dépôt de l'avalanche rocheuse ; 4 : cicatrice ; 5 : courbe de niveau ; C : Stade initial : une masse épaisse de roches sédimentaires, aux plans de stratification bien marqués et affectée de diaclases verticales, commence à glisser ; D : Une fois le déplacement amorcé, l’intense frottement à la base et les vibrations de la masse rocheuse en mouvement provoquent une délamination de toute la masse le long des plans de faiblesse correspondant aux joints de stratification ; E : Chaque dalle se déplace indépendamment des autres. Les fragments débités par les surfaces S2 sont basculés comme des livres sur une étagère. Au sommet, l’absence de pression induit un gonflement dispersif anisotrope, à l’origine de la formation d’une masse fluide complexe constituée de minuscules fragments. 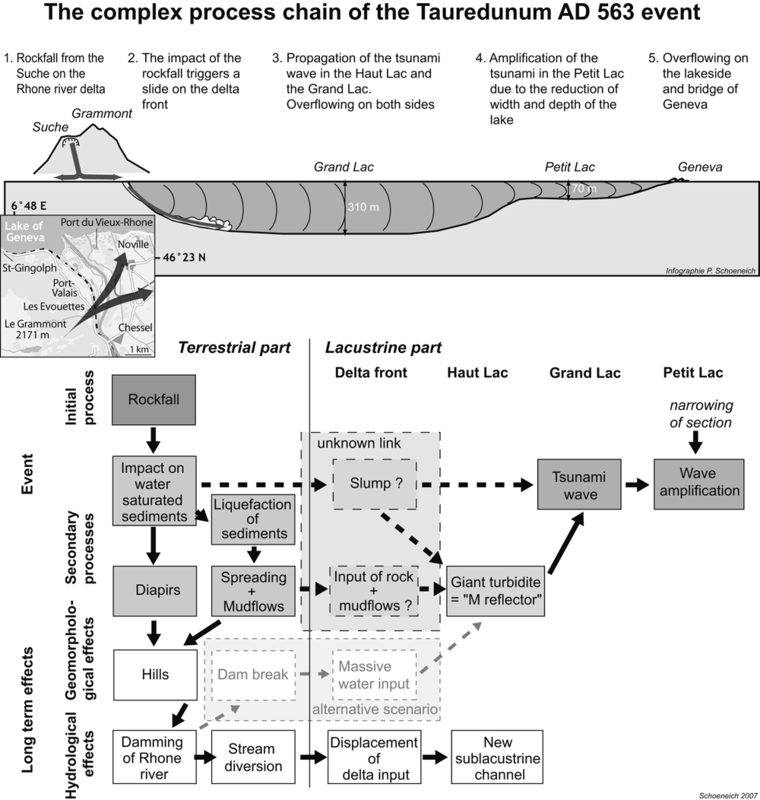 13Numerous theoretical models for the transport mechanisms of long runout landslides propose that strong grain interactions are necessary to fluidise the granular mass (McSaveney, 1978; Davies, 1982; Melosh, 1987; Shaller and Smith-Shaller, 1996). However, such interactions, if they require turbulent behaviour, should destroy the fabric. This is not the case at Flims (Schneider et al., 1999), where two different lithofacies are recognized, preserved in the rock avalanche deposits. The near-surface material as well as at the margins in distal and lateral domains appears as a matrix-supported heterometric breccia with shattered clasts (“granular facies”). However, within the internal part of the rockslide deposit, as well as in the proximal domains, lies a “well structured facies” that characterises about 60% of the outcropping formations (Pollet et al., 2005; Wassmer et al., 2004). Intensely fractured but only slightly deformed, the material displays the same structure as the rocks of the source, with sedimentary bedding concordant with the sliding surface (fig. 3C). This facies is characterised by the presence of numerous major surfaces of discontinuity. Parallel to the bedding planes, and thus to the sliding surface, these undulating surfaces correspond to fine grained layers (fig. 3D). Their thickness increases from centimetre to meter from the base to the top of this lithofacies. These major discontinuities (S1 surfaces) delimit rock slabs. The thickness of these slabs also increases from the base to the top of this facies from centimetre to decametre. Within the slabs limited by S1 surfaces, numerous oblique parallel fractures can be observed. These secondary discontinuities (S2 surfaces) never cross-cut the S1 surfaces, but always dip toward the source of the movement and delimit highly fractured clasts that are centimetric to decimetric thick (fig. 3E). 14On the basis of the distribution of the two lithofacies within the deposits, a new model of transport mechanism was proposed (Schneider et al., 1999; Pollet et al., 2005). The thick stratified mass begins to slide on a structural surface. At the early stage of displacement, the vibration induced by the sliding as well as the shearing between base and top of the sliding block generate a delamination of the moving mass along the weak surfaces corresponding to the sedimentary bedding planes. Starting at the base, this individualisation of parallel slabs evolves to the top during transport. Each of these numerous surfaces, defining slabs, plays the role of a sliding surface within the sturzstrom body. Friction during sliding is then concentrated not only at the base of the avalanche but within the whole moving mass, along shearing surfaces (S1) composed of highly fragmented limestone (cataclastic gouge). Each slab limited by two S1 surfaces moves as an independent unit. Because of the loading of the upper material and the confinement in the narrow Rhine Valley, the friction intensity along S1 surfaces decreases from the bottom to the top. As a consequence, the velocity of the slabs increases from the base to the top of the moving mass. The sturzstrom appears to behave accordingly to layered parallel slip movements. This mechanical behaviour leads to a stretching of the displaced mass. Within the slabs, the differential shearing between the base and the top, induced by the velocity gradient within the avalanche, generates an intense dynamic fracturing. Parallel fractures (S2) which do not cross-cut the S1 surfaces are formed. These fractures define the centimetric to decimetric clasts, which undergo a rotation-tilting like books on a bookshelf. This tilting contributes also to the stretching of the debris and leads to a thinning of the moving mass. At a larger scale, the tilting of the clasts within each slab induces shearing planes that delimit smaller clasts. These mechanisms are at the origin of an intense dynamic fracturing of the whole avalanche mass. The behaviour of the rock avalanche leading to this structured fabric is consequently not turbulent. 15The initial 5000 m in length mass that slid down, corresponds after emplacement to a mass of 9000 m. The total stretching of the mass is then 4000 m. The contribution to this stretching by the rotation-tilting of the intra-slabs clasts (delimited by S2 surfaces) is about 150 m. Observations on the numerous outcrops in the field allow to consider that the remaining 3850 m stretching was accommodated by a mean of 1650 S1 sliding surfaces. We can assume that each slab, from base to top within the deposit, slides on the underlying slab on an average distance of 2.33 m before being stopped (Wassmer et al., 2004). This mean value hides large variations of the accommodation gradient from the base, where the measured movement was millimetric to centimetric, to top where it can be plurimetric. This gradient is related to the decreasing of the overburden and confinement to the top of the travelling mass. 16Medium scale landslides are quite common in the Crystalline Alps. More generally, postglacial debuttressing is all the more efficient because it takes place along recently deglaciated mountain slopes that are affected by varying discontinuities (faults, joints, schistosity planes) inherited from an older, complex tectonic history. The nature of the bedrock, together with the morphology of the valley and the glacial history, are factors that control the modes of emplacement. This is the case of the large Fontfroide rock avalanche, located on the eastern flank of the Massif des Écrins in the Vallouise valley (fig. 1, site 6). This valley is deeply cut into massive granitic and gneissic bedrock, locally densely fractured. It was carved out by 600–900 m thick, ice streams that developed during the last glaciation. After glacial retreat, a rock avalanche developed, that emplaced a steep, 150 m high, cone-shaped mass (fig. 4). The avalanche material is a mixture of large blocks (volume commonly between 10 and 20 m3) and matrix produced by the shattering and crushing of the falling mass. Several stages of failure were distinguished on the basis of sedimentological, morphological, and petrographic evidence (Cossart et al., 2008). The initial failure occurred immediately after local deglaciation (6.5 ka, 10Be dating), thus suggesting a post-glacial debuttressing stress release and collapse, which would make it a paraglacial phenomenon. Other smaller size failures occurred several millennia later (1.5 ka, 10Be dating), as a progressive restoration of slope equilibrium (Cossart et al., 2008). This retrogressive evolution in time helped reinforcing the stability of the dam created by the rock avalanche runout, the persistence of which is favoured by the confinement of the valley (Cossart and Fort, 2008a). Fig. 4 – Geomorphic map of the Fontfroide – Pré de Madame Carle area (modified after Cossart and Fort, 2008a). Fig. 4 – Croquis géomorphologique du secteur Fontfroide – Pré de Madame Carle (modifié d’après Cossart et Fort, 2008a). Note that the location of the Violettes glacio-torrential debris fan right across the Fontfroide rock-avalanche accumulation does not leave any space for the Torrent de Saint Pierre, thus allowing only a small amount of debris to be exported out of the system. Caption: 1: main ridges; 2: summit; 3: elevation point; 4: stream; 5: glacier (as mapped in July 2003); 6: Last Glacial Maximum trimline; 7: Little Ice Age moraines; 8: rock-bar; 9: glacio-fluvial deposits; 10: tracks of scree and avalanches; 11: torrential deposit; 12: recent (since AD 1950) debris flow deposit; 13: scree – avalanche deposit; 14: scree deposit; 15: landslide mass; 16: limit of morpho-sedimentary units; 17: scar. Noter que la présence du cône des Violettes, face au dépôt d’écroulement de Fontfroide, corsète le torrent de Saint-Pierre, entravant l’exportation des débris en aval du système. Légende : 1 : crête ; 2 : sommet ; 3 : point coté ; 4 : cours d’eau ; 5 : glacier (cartographié en juillet 2003) ; 6 : limite minimale d’englacement du Dernier Maximum Glaciaire ; 7 : moraine datant du petit âge glaciaire ; 8 : verrou ; 9 : dépôts fluvio-glaciaires ; 10 : couloirs d’éboulis et/ou d’avalanches ; 11 : dépôts torrentiels ; 12 : dépôt récent (depuis 1950) de coulée de débris ; 13 : dépôt d’éboulis à avalanches ; 14 : éboulis ; 15 : dépôt d’écroulement ; 16 : limite des unités morpho-sédimentaires ; 17 : cicatrice d’arrachement. 17In contrast, the Mont Granier (1930 m a.s.l.) stands isolated, 1700 m above the Chambéry-Montmélian transverse valley and the Isere plain (fig. 1, site 3). It is surrounded by impressive limestone cliffs. At its feet, gentler slopes extend up to a broad chaotic depression between 300 and 350 m a.s.l. The Mont Granier is underlain, from top to bottom, by the 250 m-thick Barremian-Aptian limestone, the 100 m-thick Hauterivian marls, the 100 m-thick Upper Valanginian limestone, and the 350 m-thick Lower Valanginian marls. The 120 m-thick Upper Jurassic limestone constitutes the last scarp upslope of the chaotic depression (fig. 5A). The AD 1248 disaster was the result of a limestone cliff collapse and a gravity slide of the Valanginian marls. The marls are 12° to 20° dipping to the east, and control the topographic slope. The Barremian-Aptian limestone had previously been weakened by many faults and strike-slip faults (Gidon, 1990) and development of an intense karstic network. The landslide, that evolved downslope into a mudslide, affected a vast area, the boundaries of which were the subject of contention (Pachoud, 1991; fig. 5A). The deposits related to the landslide and mudslide, are recognizable by the presence of blocks or fragments of Urgonian limestone or Neocomian (i.e. Valanginian and Hauterivian) in a clay matrix. In some areas the chaotic landform with blocks characterizing the slipped deposits can be subdued. In addition, sedimentological analyses show that the limestone rockfall only represents about 10 % of the total mass, while the muddy deposits derived from the Valanginian marls form the largest part of the landslide deposit. Therefore, an initial rockfall could have first triggered in the marly bedrock a slide, then a mudflow that spread over the entire slope (Nicoud et al., 1999). The total area affected by the landslide is 32 km2 (scar and accumulation area). On the basis of 15 cores drilled in and outside of the landslide area (fig. 5C), the limits of the mudslide and its 3D extent were reconstructed (Nicoud et al, 1999). The thickness reaches 30 meters in the downstream part of the landslide, and can be up to 100 m in the vicinity of Lachat, in the upstream part. A portion of the mudslide has flowed downstream of Seloge and filled up (≈ 6 x 107 m3) an old NW-SE oriented depression where the A3 highway is now located. This suggests the mudflow travelled a distance exceeding 10 km. The volume of the accumulation zone is 35 x107 m3 (fig. 5B). Fig. 5 – Mont Granier. A: Simplified geological map of the Mont Granier area; 1: Granier landslide area; 2: Quaternary; 3: Urgonian – Hauterivian; 4: Valanginian – Berriasian; 5: Upper Jurassic; 6: sulphated spring location; 7: drill core; 8: elevation in m a.s.l. ; 9: limits of the “collapse”, as shown on the 1969 geological map; 10: fault, strike-slip fault; B: isopachs map of the deposits. 1: estimated thickness of scar; 2: thickness of accumulated deposits; C: geological cross section along the section line C (fig. 5B); 1: landslide deposits; 2: alluvial and lacustrine deposits, including organic rich levels; 3: Würmian till and old alluvium; 4: substratum. A : Carte géologique simplifiée de la zone du Mont Granier 1 : surface du glissement; 2 : Quaternaire ; 3 : Urgonien-Hauterivien ; 4 : Valanginien-Berriasien ; 5 : Jurassique supérieur ; 6 : sources sulfatées ; 7 : forages carottés ; 8 : altitude en mètres ; 9 : cicatrice de l'écroulement, d’après la carte géologique de 1969 ; 10 : faille et décrochement ; B : Carte isopaque des dépôts. 1: épaisseur estimée ; 2 : épaisseur des dépôts accumulés ; C : coupe géologique selon la section C (fig. 5B) ; 1 : dépôts glissés ; 2 : alluvions et dépôts lacustres ; 3 : moraine würmienne et alluvions anciennes ; 4 : substratum. 18In the above examples, some landslides were emplaced on bedrock, corresponding either to sound rocks (Dhampu or Fontfroide rock avalanches), others onto superficial deposits (till, alluvium or slope deposits; e.g., Mont Granier mudslide on till). The Flims sturzstrom travelled over both bedrock and superficial deposits, the latter including the Bonaduz alluvial gravels which it impacted, liquefied and deposited in an adjacent valley in the vicinity of the large rock avalanche (Poschinger and Kippel, 2009; fig. 3A). When a landslide falls over glaciers (e.g., Brenva) or water saturated sediments (e.g., Tauredunum), these generate other distinct characteristics in the mode and nature of runout structure, and subsequent landslide deposits. 19The mobility of a rock avalanche runout may be enhanced if it falls on a glacier ice surface, as observed in the Mont Blanc and Vanoise massifs (fig. 1, sites 4 and 5). There we noted an excessive travel distance, i.e. the horizontal distance beyond the expected runout distance with a ‘normal’ friction coefficient of 0.62 (Evans and Clague, 1994). This enhanced mobility may result from the low coefficient of friction of a debris/ice and snow interface (e.g. 0.25 for the AD 1717 Triolet rock avalanche, Mont Blanc massif: Deline, 2008), and from the incorporation of ice and snow by the rock avalanche, which fluidises the mass during motion. Because glaciers have gentle slopes relatively to rockwalls, greater snow accumulation can occur on their surfaces so that rock avalanches falling on them may also trigger snow avalanches whose air blast facilitates the entrainment of debris. The channelling of rock avalanche lobes by lateral moraines (e.g., Brenva 1997; fig. 6A) or glacial troughs (e.g. Triolet events) may also increase this mobility. Fig. 6 – Characteristics of the last rock avalanches on the Brenva Glacier (Mont Blanc massif). Fig. 6 – Caractéristiques des dernières avalanches rocheuses sur le glacier de la Brenva (massif du Mont Blanc). A: scars (thick lines) and tracks (thin lines) of the rock avalanches of the 19 November 1920 (white lines) and 18 January 1997 (black lines); B: 1997 scar on the Eperon de la Brenva (G. Mortara, February 1997); C: 25-m-high ridges of the 1997 mixed deposit in the distal area (E. Dal Molin, 18 January 1997). A : niches d’arrachement (traits épais) et parcours (traits fins) des écroulements rocheux de 19/11/1920 (traits blancs) et 18/01/1997 (traits noirs) ; B : niche de 1997 sur l’Eperon de la Brenva (G. Mortara, 02/1997) ; C : bourrelets de 25 m de haut dans le secteur distal du dépôt mixte de 1997 (E. Dal Molin, 18/01/1997). 20Rock avalanches falling on glacier entrain a large amount of glacier ice and snow (e.g., ice content of the 1997 Brenva deposit was estimated at 70-75%; fig. 6C). After this component has melted, the final rock debris deposit presents several characteristics: (i) due to fluidisation, its thickness is generally in the range of 1-2 m, combining thicker areas of dense debris with debris veneers; (ii) its topography is usually chaotic, with an open-work structure; (iii) its margins are marked by a small talus which can reach a few meters in height (e.g., distal area of the AD 1717 Triolet deposit; Deline and Kirkbride, 2009); (iv) clasts are mostly angular and subangular (plus glacially-rounded boulders entrained from moraines), with smaller clasts piled up on larger ones by ice-snow melting. 21Conversely, the huge Tauredunum rockfall (AD 563) fell on water-saturated deposits, on the upper end of Lake Geneva (fig. 1, site 3) and triggered, directly or indirectly, an impulse wave that reached the city of Geneva (fig. 7A). It is one of the oldest known and most famous historical catastrophic events in the Alps. The exact location cannot be interpreted from the texts, and the two written sources give partly contradictory versions of the processes involved. This led historians and geologists since the 19th century to search for field evidence. Hills of deformed sediments emerging above the Rhône River delta (known as the Chessel-Noville hills) have been variously interpreted either as the consequence of the rockfall impact, or as glacitectonic features. For several years an interdisciplinary study has worked to resolve the questions of the location and processes involved in the event. It combines historical, archaeological and geomorphological/geological approaches, using sedimentology, terrestrial and lacustrine geophysics (Dupuy, 2006), dating methods and comparison with similar cases (Schoeneich, 2000). Sedimentological observations on excavations showed the complex internal structure of the hills: a diamict of silt supporting clasts and metric blocks is interbedded with rafts of deformed stratified delta sediments. Large blocks have been transported across the entire, level plain, as far as 4 km from the source area. This suggests a spreading by mudflows, whereas ground penetrating radar profiles showed that some hills could result from diapiric uplifts (Beres et al., 2000). In the sublacustrine Rhône delta area, a seismic reflector known from previous studies was reinvestigated and extensively mapped. It is interpreted as a giant turbidite, which may be related to the impulse wave. The profiles show that ancient delta channels were covered by the event, and that new channels formed at their present location after the event (Dupuy, 2006). This supports the hypothesis of a river diversion by the rockfall, as it can be inferred from the topography. These new data allow today to propose a new interpretation, involving a complex process chain (fig 7B): a rock mass of an estimated volume of 20–40 x 106 m3 fell on water-saturated fine grained sediments of the lacustrine Rhône river delta. The impact triggered a partial liquefaction of the sediments. A mixture of liquefied sediments and rock debris spread as mudflows over the entire flood plain, whereas volume compensations induced diapiric uplift of sediments, both processes forming the hills that can be observed today. In the same time the event triggered a failure of the sublacustrine delta front, inducing a huge turbidite that triggered the impulse wave; it propagated throughout the entire Lake of Geneva and was amplified at its lower end by the reduction of both width and depth of the lake (Schoeneich et al., 2007). Several questions are still open, particularly the triggering process of the turbidite. However, this study allows already a consistent interpretation of the historical event. Fig. 7 – The complex process chain of the AD 563 Tauredunum event, in the Lake of Geneva (modified from Schoeneich et al. 2007). Fig. 7 – Complexité du processus en chaîne lié à l’événement du Tauredunum, 563 AD, qui s’est produit dans le lac Léman (modifié de Schoeneich et al., 2007). A: The process chain leading to the impulse wave; B: Flow chart of the whole process chain. A : Le processus a engendré une onde de choc ; B : Diagramme montrant l’ensemble du processus en chaîne. 22As already suggested by the Tauredunum case, the occurrence of large slope failures may impact the geomorphic system at a wide range of spatial and temporal scales. Depending on their nature and volume, their impact may be local and short-lived in time, whereas the largest features may influence landscape morphology and evolution for thousands of years. This is the case in the Himalayas-Karakoram-Pamir ranges, as extensively described by M. Fort (1987), M. Fort and J.-P. Peulvast (1995), K. Hewitt (2002, 2006, 2009), K. Hewitt et al. (2008) and M. Fort et al. (2009). For instance, the persistent erosion in the Kali Gandaki gorge section together with the distinctive braided pattern of the river upstream of the Dhampu-Chooya runoutindicate that the impoundment of the valley by this rockslide is still effective (fig. 2C), and controls the river incision that tries to keep pace with the mountain uplift (Fort, 2000). The Flims event has also had a considerable impact on the Upper Rhine watershed (Wassmer et al., 2004; Schneider et al., 2004; Poschinger and Kippel, 2009). We will here concentrate on examples from the French Alps. 23Impacts of rock avalanches on glacial budgets are worth consideration, such as in the Mont Blanc study case. When repeated rock avalanches pile up debris on the same site, its topography is modified, with the creation of particular landforms; for example the distal side of the Brenva right-lateral moraine (Deline, 2001). As the volume of debris deposited by a rock avalanche, which travels on a glacier, is generally greatly increased by an ice-snow component, narrow valleys are frequently dammed to form temporary lakes. In the Mont Blanc massif, the AD 1717 Triolet rock avalanche dammed the upper Italian Val Ferret (Deline and Kirkbride, 2009). Lakes were generally impounded at the entrance of the Val Veny by the Brenva rock avalanches involving a ca. 50 m- and 30 m-thick mixed deposit in the Doire stream bed in 1920 and 1997, respectively. The ice content makes these temporary dams unstable and short-lived, leading to outburst floods generated by dam failure. A major outburst flood triggered by a Brenva rock avalanche probably happened at ca. 2.5 ka BP, as suggested by the deposit with matrix-supported, granite subrounded boulders scattered on a wide area several kilometers downstream of the glacier, in the town of Courmayeur (Deline, 2008). 24The rock avalanche deposit on a glacier produces or adds to a debris cover, because both glacier flow and backwasting due to differential ablation contribute to spread the deposit at the glacier surface. This debris cover has a very efficient insulating effect when it is over 10 cm-thick, and can greatly change the dynamics of the receiving glacier. Triolet Glacier experienced a long-term advance after AD 1717, while the front of the Brenva Glacier experienced an advance until 1940 whereas the other glaciers of the massif retreated from the mid-1920s (Deline, 2005). Although it reaches very low altitude (e.g. 1400 m a.s.l. at Brenva), the front of debris-covered glaciers shows limited retreat: between 1930 and 1970-75, the front of the debris-covered Miage glacier and the debris-free Mer de Glace experienced a retreat of 50 and 750 m, respectively. Finally, long term debris-covered glaciers like Miage (Deline and Orombelli, 2005) and Brenva, which are mainly supplied by rock avalanches, are characterised by huge lateral moraines (Deline, 2001, 2008). 25The effects of landslide damming have been recognized in different areas of the French Alps and are now systematically studied in the Écrins massif (Cossart and Fort, 2008a, 2008b; Schoeneich et al., 2008). Investigations showed that most braided flood plains are due to landslide damming, either by rock avalanches or by slides. The damming of streams by slope movements, forming sediment traps and flats, proves to be a main process in the evolution of river longitudinal profiles of active orogens (Hewitt, 2006; Fort, 2000; fig. 2A). In the Massif des Écrins (fig. 1, site 6), the debris runout associated with the first Frontfroide rock avalanche accumulated on the valley floor, dammed the river, and created a sediment trap, the aggradational plain called ‘Pré de Madame Carle’. This trap was supplied longitudinally with debris derived from the Glacier Blanc and Glacier Noir margins and brought by glacial melt waters, and laterally with debris from adjacent valley-side footslope deposits (avalanches, rockfall, proglacial stream, and debris flow). According to the reconstruction of both longitudinal and lateral profiles, the thickness of the ‘Pré’ sediment infill is ca 20–50 m and the trap corresponds to a large sedimentary assemblage of 53 x 106 m3, with about half of this volume corresponding to the Fontfroide rock avalanche deposit (23 x 106 m3; Cossart and Fort, 2008a). Finally, the volume of sediments exported out of the system corresponds to the entrenchment of Torrent de Saint Pierre (3 to 5 meter-deep), and is estimated to be ca 0.1 x 106 m3. In addition, the rock-avalanche mass is currently affected by active debris flows, also by-passing the dam (Cossart and Fort, 2008a) (fig. 4). This volume is negligible compared to the volume of sediments stored upvalley and does not represent more than 1% of the overall budget since the creation of the dam, 6400 years ago. 26In this case, we see that large rock failures are an efficient way to provide large amounts of sediments while, on the other hand, such landslides can generate a persistent and large sediment trap (volume = order 107 m3), controlling the sediment fluxes several millennia after their occurrence. Here, the rock avalanche runout blocks the sediment export from the headwaters in spite of intense post-glacial reworking. In fact, the rate of debris removal is controlled and considerably reduced by river bed armouring, all the more efficient in that the stream power of these upper alpine rivers is rather low and rarely sufficient for the transportation of the large boulders composing the whole mass of the dam. 27Another debated issue is the fact that, besides structural weaknesses and in addition to seismicity, rockfall and/or rock avalanches can be triggered by paraglacial processes (following Last Glaciation Maximum and Neoglacial fluctuations), and by permafrost degradation (Deline, 2005). The difficulty is to link with certainty a collapse with any one of these factors. Events triggered during earthquakes may be directly linked to the seismicity. In the Mont Blanc massif for example, the Pic Sans Nom (3791 m a.s.l.) and the West Face of the Petit Dru (3730 m a.s.l.) have been affected by rockfalls during the 13 August 1905 earthquake (magnitude 5 to 6 after Sismalp; Ravanel and Deline, 2008). In other cases the casual links are more tenuous as less than ten historical events can be linked with certainty to a seismic trigger (Schoeneich et al., 2008). 28Debuttressing of rockwalls resulting from downwasting and retreat of glaciers (Ballantyne, 2002) has certainly affected the valley sides after the LGM. It probably favoured rock avalanches during the Late Glacial, like in the Invernet and Rocafort areas in the Vanoise massif (fig. 1, site 5; Guisset and Deline, 2006) or in the Massif des Écrins (fig. 1, site 6; Cossart et al., 2008). But control by paraglacial adjustment during the Holocene seems low: in the Mont Blanc massif, the source areas of the studied rock avalanches are all located on steep rockwalls standing above the equilibrium line altitude, where altimetric variations of the glacier surface are insignificant (Vincent et al., 2007). Main rock avalanches on the Italian side of the Mont Blanc massif since 2500 BP occurred on 250-1000-m-high steep granitic rockwalls, where top of the detachment zone scars always lie above 3400 m (Deline, 2008), reaching 4200 m at the Grand Pilier d’Angle affected by the AD 1920 Brenva rock avalanche (fig. 6A; Deline, 2001). Nevertheless, debuttressing due to limited glacial downwasting during Little Ice Age and other Neoglacial episodes could also contribute to the triggering of rock avalanches on certain steep rockwalls (e.g., Balmes glacier, Vanoise massif). 29The hypothesis that relates permafrost degradation with an increase of high-mountain rockwall instability gains force, both for the present and for earlier warm periods of the Holocene. Because of the increased mean annual air temperature in the Alps during the 20th century, permafrost degradation is thought to be an important mechanism through which climate controls slope stability and natural hazards in mountain areas (Haeberli et al., 1997; Harris et al., 2003; Noetzli et al., 2003; Gruber and Haeberli, 2007). Scars of the 20th century rock avalanches in the Mont Blanc massif (fig. 6B) are generally located in areas affected by permafrost degradation, as suggested by the measurements (Ravanel and Deline, 2008) and the modelling of the temperature distribution in rockwalls (Gruber et al., 2004; Noetzli et al., 2007). 30The French-Italian project PERMAdataROC (2005-2008) aims, among other goals, to achieve a better understanding of the sensitivity of steep rock slopes of high mountains to rockfalls (Ravanel and Deline, 2008), in particular through a network of in situ observers (mountain guides, hut keepers, researchers). The exceptional rockfall activity in the Alps during the 2003 summer heat wave indicates this sensitivity (Schiermeier, 2003; Gruber et al., 2004) – Swiss summer temperatures were 4°C to 5.5°C above the mean values of the 1864-2003 period, and drought was the highest since at least 500 years. In the Mont Blanc massif, 135 rockfall deposits (>500 m2) were identified on a Spot image as of 23 August 2003. Eight deposits have surface areas between 10,000 and 60,000 m2. The largest deposit corresponds to the collapse of a >70-m-high pillar in the SW face of the Aiguille du Diable (4114 m a.s.l.). Neither heavy precipitations nor other short-term and extreme phenomena affecting the slopes stability can explain the frequency of rockfalls during this 2003 summer. In contrast, a smaller number of events occurred in the recent summers: 44 and 19 rockfalls were observed in 2007 and 2008, respectively – but the larger one reached 50,000 m3. This suggests that the degradation of permafrost is a plausible factor. The hypothesis is reinforced by the presence of massive ice in the detachment zones of several rockfalls (e.g. 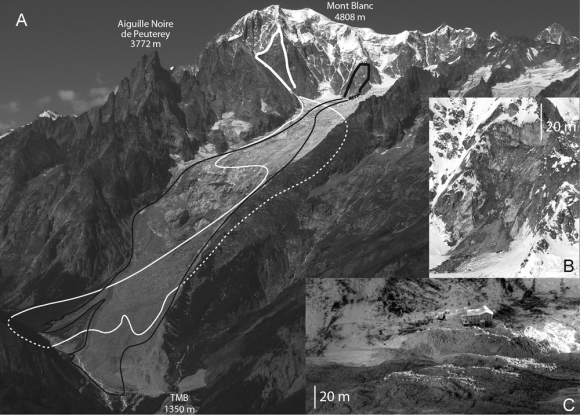 the 2007 scar at Tour des Grandes Jorasses; Deline: 2008), and by the strong water percolation into the tunnels of the Aiguille du Midi cable-car station, at 3848 m a.s.l. (Gruber and Haeberli, 2007). The west face of Les Drus, which is 1000 m-high, now bears a 70 m-wide and nearly 600 m-high grey scar that results from the June 2005 collapse of the Bonatti Pillar (fig. 8A), which produced a total rock volume of 265 ± 10 x 103 m3 (fig. 8B and 8C; Ravanel and Deline, 2008). The supraglacial debris cover and the large moraine suggest that the 2005 rock avalanche is the last in a series that affected this face during the Holocene. Seven rockfalls occurred between 1905 and 2003 (0.35 ± 0.05 to 27.5 ± 2.5 x 103 m3), and the eight events occurred during the warmest periods recorded over the last 100 years (Ravanel and Deline, 2008). Fig. 8 – Les Drus rock avalanche of 2005. Fig. 8 – Écroulement des Drus de 2005. A: The west face of Les Drus and the scar of the June 2005 rock avalanche; B: extension of the 2005 deposits (90 000 m2); C: detail of the deposit at the diffluence above the moraine of the Drus debris-covered glacier. A : La face ouest des Drus et la cicatrice de l’écroulement de juin 2005 ; B : extension du dépôt de l’écroulement (90 000 m2) ; C : détail du dépôt au niveau de la diffluence par-dessus la moraine du glacier noir des Drus. 31More generally, a large number of rockfalls/rock avalanches has taken place in periglacial areas of the Alps throughout history. Today, consequences of those events involved in high altitude should not be underestimated by risk managers, especially in the present context of global warming, while authorities have to take into account increasing, contradictory demands for security and economic development (huts, cable-cars and mountaineers flows). More insidious are the possible consequences of rock avalanches in valleys because of spillover effects (avalanches, mudslides, debris flows, and rockfalls). 32The different examples that illustrate this article have shown the diversity of research recently carried out on large landslides by French scholars. Several perspectives are left open. Firstly, field work should be reinforced in order to better document the modes of emplacements and decipher the triggering and predisposing factors of large scale rockslope failures. This should be backed onto absolute chronology (14C, OSL, cosmonuclides, etc. ), so that the causative factors (seismo-tectonics versus climate) can better be sorted out. Secondly, field data should be more systematically coupled with geotechnical surveys (LIDAR, GPR, core drillings, etc.) in order to (i) estimate the volume of rockfall and rate of denudation in high alpine slopes, (ii) assess the extent and volume of runout deposits (through GIS and DEM facilities), hence (iii) establish a sediment budget that may highlight the role of large landslides, in both the overall evolution of the hillslopes and the magnitude of hazards that might be generated upstream and downstream from them. In addition, the effects of a rock failure can involve complex processes and be much more devastating than the simple spreading of the rock mass. Finally, the possible influence of climate change on alpine rockwalls and potential threat to adjacent inhabited areas are becoming a key and debated issue of current research in mountain geomorphology and environments (Slaymaker and Kelly, 2007). Baade J., Lang A., Mäusbacher R., Wagner G.A. (1998) – Quaternary lake deposits in the Thakkhola graben, Mustang, Nepal. 13th Himalaya-Karakoram-Tibet International Workshop, Apr. 20-22 1998, Peshawar, Pakistan. Abstract volume 22-23. Ballantyne C.K. (2002) – Paraglacial geomorphology. Quaternary Science Reviews 21, 1935-2017. Beres M., Green A.G., Pugin A. (2000) – Diapiric origin of the Chessel-Noville hills of the Rhone Valley interpreted from georadar mapping. Environmental and Engineering Geoscience 6/2, p. 141-153. Bilham R.K., Larson K., Freymuller J., Project IDHYLIM members (1997) –GPS measurementsof present day convergence across the Nepal Himalaya. Nature 386, 61-64. Brunsden D., Jones D.K.C. (1984) – The geomorphology of high magnitude-low frequency events in the Karakoram mountains. In Miller K.J. (Ed. ): The International Karakoram Project, vol. 1, Cambridge University Press, Cambridge, 383-388. Burbank D.W., Leland J., Fielding E., Anderson R.S., Brozovic N., Reid M.R., Duncan C. (1996) – Bedrock incision, rock uplift and threshold hill slopes in the northwestern Himalayas. Nature 379, 505-510. 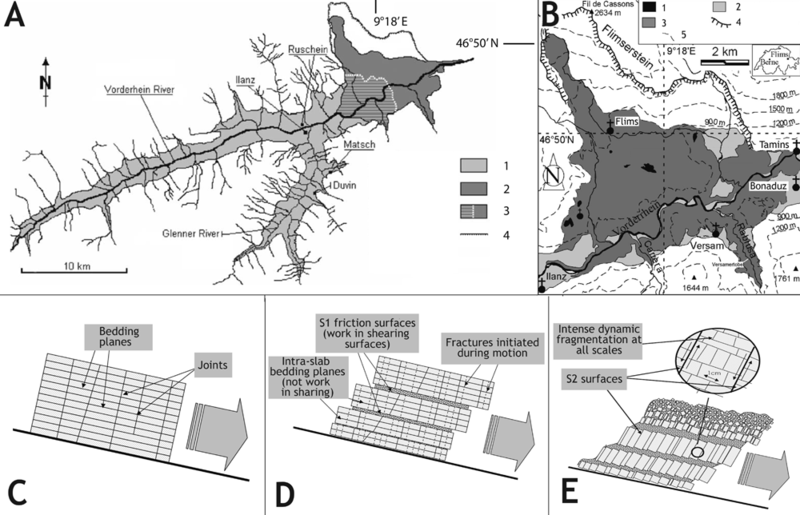 Cossart E., Fort M. (2008a) – Consequences of landslide dams on alpine river valleys: examples and typology from the French Southern Alps. Norsk Geografisk Tidsskrift – Norwegian Journal of Geography 62, 75-88. Cossart E., Fort M. (2008b) – Sediment release and storage in early deglaciated areas: towards an application of the exhaustion model from the case of Massif des Écrins (French Alps) since the Little Ice Age. Norsk Geografisk Tidsskrift – Norwegian Journal of Geography 62, 115-131. Cossart E., Braucher R., Fort M., Bourles D., Carcaillet J. (2008) – Slope instability in relation to glacial debuttressing in alpine areas (Upper Durance catchment, southeastern France): Evidence from field data and 10Be cosmic ray exposure ages. Geomorphology 95, 1-2, 3-26. Cruden D.M., Hungr O. (1986) – The debris of the Frank Slide and theories of rockslide–avalanche mobility. Canadian Journal of Earth Sciences 23, 3, 425–432. Cruden D.M., Varnes D.J. (1996) – Landslide types and processes. In Cruden D.M., Varnes D.J. (Eds): Landslides, Investigation and Mitigation, National Academy Press, Washington, D.C., 36–75, 1996. Davies T.R.H. (1982) – Spreading of rock avalanche debris by mechanical fluidization. Rock Mechanics 15, 9-24. Davies T.R.H., Mc Saveney M.J., Hodgson K.A. (1999) – A fragmentation spreading model for long-runout rock avalanches. Canadian Geotechnical Journal 36, 6, 1096-1110. Deline P. (2001) – Recent Brenva rock avalanches (Valley of Aosta): new chapter in an old story? Supplemento Geografia Fisica e Dinamica Quaternaria 5, 55-63. Deline P. (2005) – Change in surface debris cover on Mont Blanc massif glaciers after the ‘Little Ice Age’ termination. The Holocene 15, 302-309. 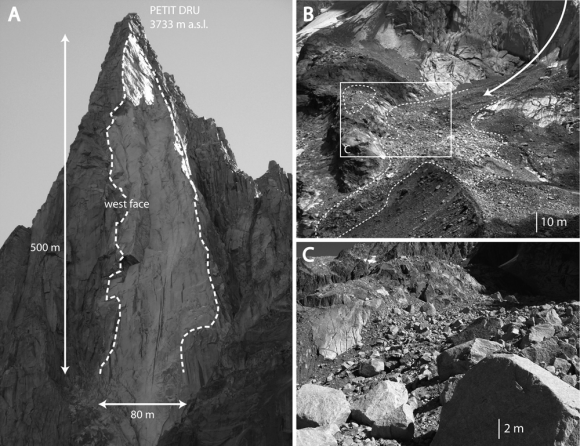 Deline P. (2008) – Interactions between rock avalanches and glaciers in the Mont Blanc massif during the late Holocene. Quaternary Science Reviews doi:10.1016/j.quascirev.2008.09.025. Deline P., Kirkbride M.P. (2009) – Rock avalanches on a glacier and morainic complex in Haut Val Ferret (Mont Blanc massif, Italy). Geomorphology 103, 80-92. Deline P., Orombelli G. (2005) – Glacier fluctuations in the western Alps during the Neoglacial as indicated by the Miage morainic amphitheatre (Mont Blanc massif, Italy). Boreas 34, 1-12. 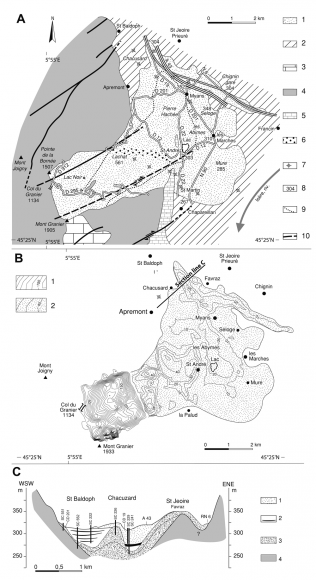 Deline P., Jaillet J., Rabatel A., Ravanel L. (2008) – Ground-Based LIDAR Data on Permafrost-Related Rockfall Activity in the Mont Blanc Massif. In: D.L. Kane and K.M. Hinkel (Eds), Proceedings of the 9th International Conference on Permafrost, Fairbanks, 2008, 349-353. Dikau R., Brunsden D., Schrott L., Ibsen M. (Eds) (1996) – Landslide recognition: identification, movement and causes. Wiley, 251 p.
Evans S.G., Clague J.J. (1994) – Recent climatic change and catastrophic geomorphic processes in mountain environments. Geomorphology 10, 107-128. Evans S.G., DeGraff J.V. (Eds) (2002) – Catastrophic landslides: effects, occurrence, and mechanisms. Geological Society of America, Reviews in Engineering Geology 15, 412 p.
Evans S.G., ScarasciaMugnozza G., Strom A.L., Hermanns R.L., Ischuk A., Vinnichenko S. (2006) –Landslides from massive rock slope failure and associated phenomena. In S.G. Evans, ScarasciaMugnozza G., Strom A.L., Hermanns R.L. (Eds), Landslides from massive rock Slope Failure, NATO Science Series IV, v.49, Springer, Dordrecht, Netherlands, 3-52. Flageollet J.-C. (1988) – Les mouvements de terrain et leur prévention. Masson, Paris, 224 p.
Fort M. (1987) – Sporadic morphogenesis in a continental subduction setting: an example from the Annapurna Range, Nepal Himalaya. Zeitschrift für Geomorphologie N.F. Supplement-Band 63, 9-36. Fort M. (2000) – Glaciers and mass wasting processes: their influence on the shaping of the Kali Gandaki valley (higher Himalaya of Nepal). Quaternary International 65/66, 101-119. Fort M., Freytet P., Colchen M. (1982) – Structural and sedimentological evolution of the Thakkhola-Mustang Graben (Nepal Himalaya). Zeitschrift für Geomorphologie N.F. Supplement-Band 42, 75-93. Fort M., Cossart E., Arnaud-Fassetta G. (2009) – Interactions between unstable mountain slope and Kali Gandaki River: a sedimentary budget approach. In J.-Ph. Malet, A. Remaître, T. Bogaard (Eds): Landslide processes: from geomorphologic mapping to dynamic modelling, CERG editions, Strasbourg, 25-29. Fort M., Peulvast J.-P. (1995) – Catastrophic mass-movements and morphogenesis in the Peri-Tibetan Ranges: examples from West Kunlun, East Pamir and Ladakh. In Slaymaker O. (Ed. ): Steepland Geomorphology. Wiley, Chichester, 171-198. Gidon M. (1990) – Les décrochements et leur place dans la structuration du Massif de la Chartreuse (Alpes occidentales françaises). Géologie Alpine, 66, 39-55. Gruber S., Haeberli W. (2007) – Permafrost in steep bedrock slopes and its temperature-related destabilization following climate change. Journal of Geophysical Research 112, F02S18, doi: 10.1029/2006JF000547. Gruber S., Hoelzle M., Haeberli W. (2004) – Rock wall temperatures in the Alps: Modelling their topographic distribution and regional differences. Permafrost Periglacial Processes 15, 299– 307. Guisset M., Deline P. (2006) – Interactions entre grands écroulements rocheux et glaciers dans le massif de la Vanoise pendant le Tardiglaciaire et l’Holocène : l’exemple des secteurs de Rocafort et de l’Invernet. Travaux scientifiques du Parc national de la Vanoise, 22, 29-47. Haeberli W., Wegmann M., Vonder Mühll D. (1997) – Slope stability problems related to glacier shrinkage and permafrost degradation in the Alps. Eclogae Geologicae Helveticae 90, 407-414. Harris C., Vonder Mühll D., Isaksen K., Haeberli W., Sollid J.L., King L., Holmlund P., Dramis F., Guglielmin M., Palacios D. (2003) – Warming permafrost in European mountains. Global and Planetary Change 39, 215-225. Heim A. (1932) – Bergsturz und Menschenleben. Fretz und Wasmuth Verlag, Zürich, 218 p.
Hewitt K. (1988) – Catastrophic landslide deposits in the Karakoram Himalaya. Science 242, 64-67. Hewitt K. (2002) – Postglacial landforms and sediment associations in a landslide-fragmented river system: the Transhimalayan Indus stream, Central Asia. In Hewitt K., Byrne M.L., English M., Young G. (Eds): Landscapes of transition, Landform assemblages and transformations in cold regions, Dordrecht, Kluwer, 63-91. Hewitt K. (2006) – Disturbance regime landscapes: mountain drainage systems interrupted by large rockslides. Progress in Physical Geography 30, 365-393. Hewitt K., Clague J.J., Orwin J.F. (2008) – Legacies of catastrophic rock slope failures in mountain landscapes. Earth Science Reviews 87, 1-38. Hovius N., Stark C.P. (2006) – Landslide-driven erosion and topographic evolution of active mountain belts. NATO Sciences Series, Sub-Serie IV, Earth Environmental Science 92, 573-590. Hsü K.J. (1975) – Catastrophic debris streams (sturzströms) generated by rockfalls. Geological Society of America Bulletin 86, 129-140. Hurtado J.M., Hodges K.V., Wipple K.X. (2001) – Neotectonics of the Thakkhola graben and implications for recent activity of the South Tibetan fault system in the central Nepal Himalaya. Geological Society of America Bulletin 13, 222-240. Korup O., Clague J.J., Hermanns R.L., Hewitt K., Strom A.L., Weidinger J.T. (2007) – Giant landslides, topography, and erosion. Earth and Planetary Science Letters 261, 578-589. McSaveney M.J. (1978) – Sherman Glacier rock avalanche, Alaska. In Voight B. (Ed. ): Rockslides and avalanches, 1: Natural phenomena. Elsevier, 1997-258. Melosh H.J. (1987) – The mechanics of large rock avalanches. In Costa J.E., Wieckorek G.F. (Eds): Debris Flows / Avalanches: Process, Recognition and Mitigation, Geological Society of America Review in Engineering Geology, VII, 41-49. Montgomery D.R. (2001) – Slope distributions, thresholds hillslopes, and steady-state topography. American Journal of Science 301, 432-452. Nicoud G., Dzikowski M., Paillet A., Ghoreychi R., Emeric P. et Chignoli M. (1999) – Données nouvelles sur la nature et l'extension du glissement historique du Granier (Savoie, France). Actes du colloque de Myans, Documents, 2ème série, Tome 1, 35-54. Noetzli J., Hoelzle M., Haeberli W. (2003) – Mountain permafrost and recent Alpine rock-fall events: a GIS-based approach to determine critical factors. Proceedings of the 8th International Conference on Permafrost 2003, Zurich, Switzerland, 827-832. Noetzli J., Gruber S., Kohl T., Salzmann N., Haeberli W. (2007) – Three-dimensional distribution and evolution of permafrost temperatures in idealized high-mountain topography. Journal of Geophysical Research 112, F02S13, doi:10.1029/2006JF000545. Pachoud A. (1991) – Une catastrophe naturelle majeure : l'écroulement du Mont Granier dans le massif de la Chartreuse au XIIIe siècle. La Houille Blanche, 5, 327-332. Pollet N., Cojean R., Couture R., Schneider J.L., Strom A.L., Voirin C., Wassmer P. (2005) – A slab-on-slab model for the Flims rock slide (Swiss Alps). Canadian Geotechnical Journal 42, 587-600. Poschinger A. von, Haas U. (1997) – Der Flimser Bergsturz, doch ein warmzeitliches Ereignis? Bulletin für Angewandte Geologie 2/1, 35-46. Poschinger A. von, Kippel Th. (2009) – Alluvial deposits liquefied by the Flims rock slide. Geomorphology 103, 50-56. Poschinger A. von, Wassmer P., Maisch M. (2006) – The Flims rockslide: history of interpretation and new insights. In S.G. Evans, G. Scarascia Mugnossa, A. Strom, R.L. Hermanns (Eds): Landslides from Massive Rock Slope Failure, NATO Sciences Series, IV. Earth and Environmental Sciences, 49, 329-356. Ravanel L., Deline P. (2008) – La face ouest des Drus (massif du Mont-Blanc) : évolution de l’instabilité d’une paroi rocheuse dans la haute montagne alpine depuis la fin du petit âge glaciaire. Géomorphologie : relief, processus, environnement, 4, 261-272. Schiermeier Q. (2003) – Alpine thaw breaks ice over permafrost’s role. Nature 424, 712. Schneider J.L., Wassmer P., Ledésert B. (1999) – La fabrique interne des dépôts du Sturzström de Flims (Alpes suisses) : caractéristiques et implications sur les mécanismes de transport. Comptes Rendus de l’Académie des Sciences, Paris, Sciences de la Terre et des planètes, 328, 607-613. Schneider J.L., Pollet N., Chapron E., Wessels M., Wassmer P.(2004)–Signature of Rhine Valley sturzström dam failures in Holocene sediments of Lake Constance, Germany. Sedimentary Geology 169, 1-2, 75-91. Schoeneich P. (2000) – Impact of rockfalls on soft water-saturated floodplain sediments. Three examples from the Swiss Rhone valley. In E. Bromhead, N. Dixon, M.-L. Ibsen (Eds): Landslides in research, theory and practice. 8th International Symposium on Landslides, Cardiff 2000. Thelford Publishers 3, 1327-1332. Schoeneich P., Dupuy D., Marillier F. (2007) – A rockfall-triggered tsunami in Lake Geneva. The Tauredunumevent - 563 AD. 5th Swiss Geoscience Meeting, Geneva, 21-22. Schoeneich P., Hantz D., Deline P., Amelot F., and Rockslidetec-Action A project partners (2008) – A new database of alpine rock falls and rock avalanches. Interpraevent 2008 conference proceedings, Dorbirn/Austria, 2, 243-250. Schramm J.M., Weidinger J.T., Ibetsberger H.J. (1998) – Petrologic and structural control on geomorphology of prehistoric Tsergo Ri slope failure, Langtang Himal, Nepal. Geomorphology 26, 37-46. Shaller P.J., Smith-Shaller A. (1996) – Review of proposed mechanisms for sturzströms (long-runout landslides). In Abott P.L. and Seymour D.C. (Eds. ): Sturzstroms and Detachments Faults, Ansa-Borrego Desert State Park, California. South Coast Geological Society, Santa Anna, 185-202. Slaymaker O., Kelly R.E.J. (2007) – The cryosphere and global environmental change. Blackwell, Oxford, 261 p.
Soldati M., Corsini A., Pasuto A. 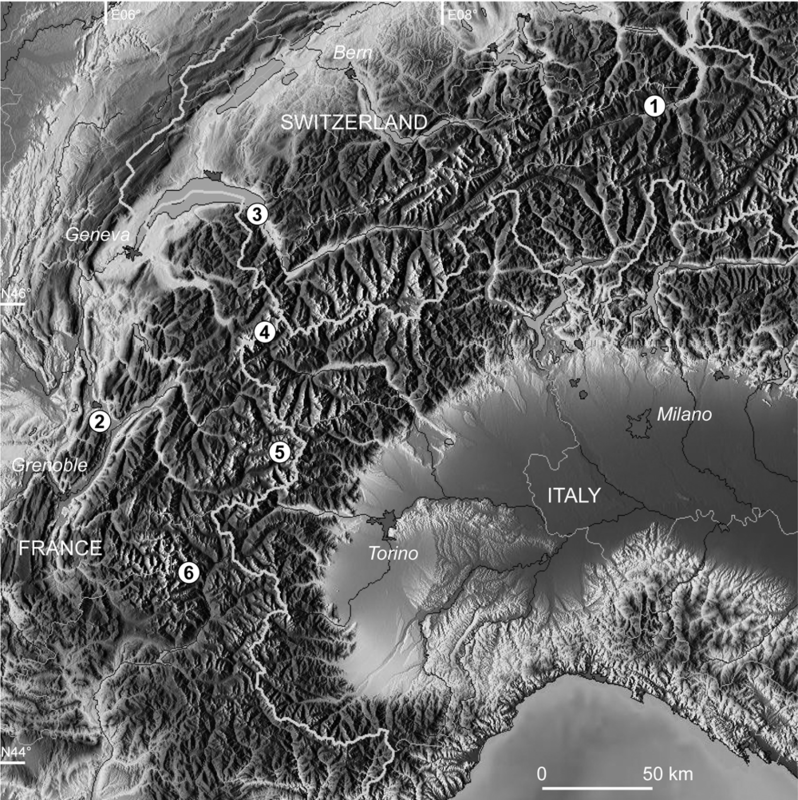 (2004) – Landslides and climate change in the Italian Dolomites since the Late glacial. Catena 55, 141–161. Strom A.L. (2002) – Morphology and internal structure of rockslides and rock avalanches: grounds and constraints for their modeling. In S.G. Evans, G.S. Mugnossa, A. Strom, R. L. Hermanns (Eds): Landslides from Massive Rock Slope Failure, NATO Sciences Series, IV. Earth and Environmental Sciences, 49, 305-326. Vincent C., Le Meur E., Six D., Funk M., Hoelzle M., Preunkert S. (2007) – Very high-elevation Mont Blanc glaciated areas not affected by the 20th century climate change. Journal of Geophysical Research 112, D09120 doi:10.1029/2006JD007407. Wassmer P., Schneider J.L., Pollet N., Schmitter-Voirin C.(2004) – Effects of the internal structure of a rock-avalanche dam on the drainage mechanism of its impoundment, Flims Sturzström and Ilanz paleo-lake, Swiss Alps. Geomorphology 61, 1-2, 3-17. Weidinger J.T. 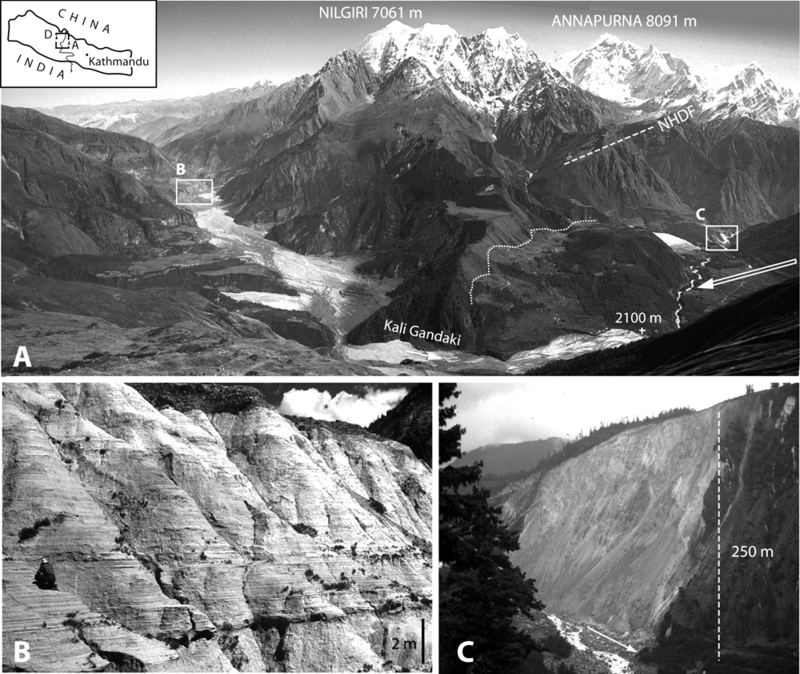 (2006) – Predesign, failure and displacement mechanisms of large rockslides in the Annapurna Himalaya, Nepal. Engineering Geology 83, 201–216. Willett S.D. (1999) – Orogeny and orography: the effects of erosion on the structure of mountain belts. Journal of Geophysical Research 104, 28957-28981. Zech R., Zech M., Kubik P.W., Kharki K., Zech W. (2009) – Deglaciation and landscape history around the Annapurna, Nepal – potential and limitations of 10Be surface exposure dating. Quaternary Science Reviews 1-15. doi:10.1016/j.quascirev.2008.11.013. Depuis longtemps les géomorphologues français ont pris, à côté des géologues structuralistes et des ingénieurs, une part dans l’étude des mouvements de terrain. Cet article est consacré aux écroulements rocheux, glissements rocheux et avalanches rocheuses rapides de plus ou moins grande ampleur, étudiés principalement dans les Alpes françaises (massifs du Mont Blanc, de la Vanoise, des Écrins, des Préalpes), suisses (massifs du Valais et des Grisons) et en Himalaya (massif de l’Annapurna). En se conformant à la terminologie anglo-saxonne, une caractérisation en est rapidement donnée. Les modes de mise en place des dépôts et les structures associées sont d’abord considérés, en relation avec le contexte géologique régional et la morphologie préexistante du secteur où se sont produits les mouvements de terrain. Les deux premiers exemples traitent de deux avalanches rocheuses volumineuses (>1 km3 et 10 km2 pour Dhampu-Chooya en Himalaya ; 12 km3 et 20 km2 pour Flims dans la haute vallée du Rhin Suisse). La première, qui obstrue depuis plusieurs milliers d’années la vallée de la Kali Gandaki, entre Annapurna (8091 m) et Dhaulagiri (8167 m), avaitcréé une vaste retenue lacustre sur plus de 30 km de long, dont les sédiments sont aujourd’hui disséqués (fig. 2). La mise en place de cette avalanche est liée à la proximité de la faille Nord Himalayenne, dans une zone qui connaît un rythme de surrection important (6-8 mm/a) (Bilham et al., 1997). La rupture s’est produite selon une direction parallèle à celle des plans de foliation des gneiss et a affecté toute une crête (Fort, 2000). La masse écroulée a bloqué la vallée dans un secteur étroit. On peut observer la pulvérisation des matériaux dans leur partie basale, tandis que des structures foliées de la roche initiale, malgré la fracturation, sont encore reconnaissables dans la partie supérieure du dépôt. Dans le cas de Flims, la masse écroulée, détachée du versant selon des plans de stratification, a disposé localement d’un espace plus ouvert ou plus large, permettant le développement d’une structure originale en “jeu de cartes” (Wassmer et al., 2004 ; Schneider et al., 1999). Cette structure est caractérisée par deux faciès, l’un granulaire, l’autre en blocs basculés séparés par des zones de broyage (fig. 3), bien étudiés grâce à l’encaissement du Rhin au travers de l’accumulation de l’avalanche rocheuse épaisse de 400 m.
Les deux exemples suivants, de volume plus réduit (de l’ordre de 107 m3), illustrent plutôt l’influence de la nature du substrat et de la morphologie du site où se produit l’écroulement. Dans le cas de l’avalanche rocheuse de Fontfroide ayant barré le Pré de Madame Carle (vallée de Vallouise ; fig. 4), l’origine de la rupture est liée à la décompression post-glaciaire, indirectement attestée par des datations par cosmonucléides (Cossart et al., 2008 ; Cossart et Fort, 2008b), tandis que l’écroulement historique du Mont Granier (1248 AD) est davantage lié au dispositif géologique des Préalpes (calcaires fissurés, mise en porte-à-faux par les marnes sous-jacentes) (Nicoud et al., 1999). Ces deux exemples s’opposent également par le fait qu’en Vallouise, la vallée étroite a favorisé la création d’un barrage toujours efficace, alors que la large vallée d’origine glaciaire qui borde le Mont Granier a permis l’étalement de la masse écroulée et son évolution quasiment synchrone en glissement boueux (fig. 5), à l’origine de nombreuses victimes. La nature de la surface sur laquelle s’écroulent les dépôts d’avalanches rocheuses est également un facteur de différenciation important. Dans le massif du Mont Blanc et de la Vanoise, les écroulements qui se produisent sur un glacier ont un impact en général plus étendu que ce que le coefficient moyen de friction laisserait présager (fig. 6), du fait de l’incorporation de neige et de glace qui facilite l’entraînement et l’étalement des débris, comme cela a bien été montré sur le glacier de la Brenva (Deline, 2008). En revanche, les écroulements qui se produisent sur des sédiments saturés en eau, comme dans le cas de l’écroulement historique (563 AD) de Tauredunum, sur le delta du Rhône dans le lac Léman, mettent en œuvre une chaîne complexe de processus (fig. 7) qui affecte à la fois les dépôts émergés et les sédiments sous-lacustres, provoquant des phénomènes de liquéfaction et même le déclenchement d’une onde de choc(Beres et al., 2000 ; Schoeneich et al.,2007). D’une façon plus générale, les grands mouvements de terrain ont un impact durable sur les systèmes morphologiques, du fait des obstructions que leurs dépôts associés peuvent provoquer dans les vallées alpines, du cloisonnement et des ruptures de pente des profils en long qui en résultent, ce qui affecte les budgets sédimentaires (Fort et Peulvast, 1995 ; Fort, 2000 ; Wassmer et al., 2004 ; Cossart et Fort, 2008a). Mais ces écroulements ont également une influence sur les bilans de masse glaciaires, en réduisant considérablement l’ablation en surface des glaciers (Deline, 2008 ; Deline et Kirkbride, 2009). Enfin, la question de l’influence des changements climatiques probables sur la recrudescence des écroulements en haute montagne est posée et évoquée à travers le suivi de l’évolution de parois caractéristiques du massif du Mont Blanc, comme la face ouest des Drus (fig. 8), qui a vu en 2005 la disparition du pilier Bonatti (Ravanel et Deline, 2008) ou la face est de la Tour Ronde (Deline et al., 2008). Les premiers résultats obtenus suggèrent une probable dégradation du permafrost. Fig. 1 – The Alps. Fig. 1 – Les Alpes. Location of six case studies in the Alps. 1: Flims; 2: Mont Granier; 3: Tauredunum; 4: Mont Blanc massif; 5: Vanoise massif ;6: Vallouise.Localisation des sites étudiés dans les Alpes. 1 : Flims ; 2 : Mont Granier ; 3 : Tauredunum ; 4 : massif du Mont Blanc ; 5 : massif de la Vanoise ; 6 : Vallouise. Fig. 2 – The Dhampu-Chooya Rock-avalanche, viewed from the east slope (4800 m) of the Dhaulagiri Peak (8167 m). Fig. 2 – L’avalanche rocheuse de Dhampu-Chooya, vue depuis le flanc est (4800 m) du Dhaulagiri (8167 m). Note the sharp bend of the Kali Gandaki river, flowing from north (left) to south (right); A: The Dhampu rockslide/rock avalanche runout, covered by forest (middle of the photograph), was a barrier efficient enough to dam the Kali Gandaki valley and allow a large lake to develop more than 30 km upstream of the dam; B: Lacustrine deposits of Marpha, nearly 200 m thick; C: Section of the Dhampu rock-avalanche runout, as displayed on the left bank of the Kali Gandaki. Fractured gneisses are still recognizable in the upper part, whereas the lower part is mostly crushed bedrock. Noter le coude marqué de la rivière Kali Gandaki, qui s’écoule du nord (à gauche) au sud (droite). A : La masse glissée de l’avalanche rocheuse de Dhampu, couverte par la forêt de conifères (plan médian), a fonctionné comme un barrage suffisamment efficace pour bloquer la vallée de la Kali Gandaki et favoriser la formation d’un immense lac sur plus de 30 kilomètres en amont du barrage ; B : Dépôts lacustres de Marpha, épais de près de 200 m ; C : Coupe à travers la masse éboulée de l’avalanche rocheuse, visible en rive gauche de la vallée de la Kali Gandaki. Les gneiss fracturés sont encore reconnaissables dans la partie supérieure de la coupe, alors que la partie inférieure est principalement composée de roches broyées. Fig. 3 – Flims rock avalanche.Fig. 3 – Avalanche rocheuse de Flims. A: The Flims Sturzström in the upper Rhine valley, with the palaeo-lake Ilanz; 1: extent of Ilanz lake; 2: rock avalanche deposits; 3: lacustrine sediments on rock avalanche deposits; 4: current hydrographic network;B: extent of the Flims Sturzström deposits; 1: lake; 2: fluvial-lacustrine deposits; 3: sturzstrom deposits; 4: scar’s outline; 5: contour line; C: Initial stage, a thick mass of sedimentary rocks displaying bedding planes and vertical joints begins to slide; D: The movement is initiated, an intense friction at the base and vibration of the sliding rocks induces thinning of the whole mass along weakness surfaces that correspond to bedding planes; E: Each slab moves as an independent unit. Clasts limited by S2 surfaces are tilted like books on a bookshelf. At the top, the absence of confinement induces an anisotropic dispersive inflation that leads to a complex fragmented flow.A : L’avalanche rocheuse de Flims, dans la vallée du Rhin supérieur, et le paléo-lac d’Ilanz; 1 : extension du lac Ilanz ; 2 : dépôt de l’avalanche rocheuse ; 3 : extension du lac sur les dépôts d’écroulement ; 4 : réseau hydrographique actuel ; B : Extension des dépôts de l’avalanche rocheuse de Flims ;1 : lac ; 2 : dépôts fluvio-lacustres ; 3 : dépôt de l'avalanche rocheuse ; 4 : cicatrice ; 5 : courbe de niveau ; C : Stade initial : une masse épaisse de roches sédimentaires, aux plans de stratification bien marqués et affectée de diaclases verticales, commence à glisser ; D : Une fois le déplacement amorcé, l’intense frottement à la base et les vibrations de la masse rocheuse en mouvement provoquent une délamination de toute la masse le long des plans de faiblesse correspondant aux joints de stratification ; E : Chaque dalle se déplace indépendamment des autres. Les fragments débités par les surfaces S2 sont basculés comme des livres sur une étagère. Au sommet, l’absence de pression induit un gonflement dispersif anisotrope, à l’origine de la formation d’une masse fluide complexe constituée de minuscules fragments. Fig. 4 – Geomorphic map of the Fontfroide – Pré de Madame Carle area (modified after Cossart and Fort, 2008a). Fig. 4 – Croquis géomorphologique du secteur Fontfroide – Pré de Madame Carle (modifié d’après Cossart et Fort, 2008a). Note that the location of the Violettes glacio-torrential debris fan right across the Fontfroide rock-avalanche accumulation does not leave any space for the Torrent de Saint Pierre, thus allowing only a small amount of debris to be exported out of the system. Caption: 1: main ridges; 2: summit; 3: elevation point; 4: stream; 5: glacier (as mapped in July 2003); 6: Last Glacial Maximum trimline; 7: Little Ice Age moraines; 8: rock-bar; 9: glacio-fluvial deposits; 10: tracks of scree and avalanches; 11: torrential deposit; 12: recent (since AD 1950) debris flow deposit; 13: scree – avalanche deposit; 14: scree deposit; 15: landslide mass; 16: limit of morpho-sedimentary units; 17: scar.Noter que la présence du cône des Violettes, face au dépôt d’écroulement de Fontfroide, corsète le torrent de Saint-Pierre, entravant l’exportation des débris en aval du système. Légende : 1 : crête ; 2 : sommet ; 3 : point coté ; 4 : cours d’eau ; 5 : glacier (cartographié en juillet 2003) ; 6 : limite minimale d’englacement du Dernier Maximum Glaciaire ; 7 : moraine datant du petit âge glaciaire ; 8 : verrou ; 9 : dépôts fluvio-glaciaires ; 10 : couloirs d’éboulis et/ou d’avalanches ; 11 : dépôts torrentiels ; 12 : dépôt récent (depuis 1950) de coulée de débris ; 13 : dépôt d’éboulis à avalanches ; 14 : éboulis ; 15 : dépôt d’écroulement ; 16 : limite des unités morpho-sédimentaires ; 17 : cicatrice d’arrachement. Fig. 5 – Mont Granier. Fig. 5 – Mont Granier. A: Simplified geological map of the Mont Granier area; 1: Granier landslide area; 2: Quaternary; 3: Urgonian – Hauterivian; 4: Valanginian – Berriasian; 5: Upper Jurassic; 6: sulphated spring location; 7: drill core; 8: elevation in m a.s.l. ; 9: limits of the “collapse”, as shown on the 1969 geological map; 10: fault, strike-slip fault; B: isopachs map of the deposits. 1: estimated thickness of scar; 2: thickness of accumulated deposits; C: geological cross section along the section line C (fig. 5B); 1: landslide deposits; 2: alluvial and lacustrine deposits, including organic rich levels; 3: Würmian till and old alluvium; 4: substratum. A : Carte géologique simplifiée de la zone du Mont Granier 1 : surface du glissement; 2 : Quaternaire ; 3 : Urgonien-Hauterivien ; 4 : Valanginien-Berriasien ; 5 : Jurassique supérieur ; 6 : sources sulfatées ; 7 : forages carottés ; 8 : altitude en mètres ; 9 : cicatrice de l'écroulement, d’après la carte géologique de 1969 ; 10 : faille et décrochement ; B : Carte isopaque des dépôts. 1: épaisseur estimée ; 2 : épaisseur des dépôts accumulés ; C : coupe géologique selon la section C (fig. 5B) ; 1 : dépôts glissés ; 2 : alluvions et dépôts lacustres ; 3 : moraine würmienne et alluvions anciennes ; 4 : substratum. Fig. 6 – Characteristics of the last rock avalanches on the Brenva Glacier (Mont Blanc massif).Fig. 6 – Caractéristiques des dernières avalanches rocheuses sur le glacier de la Brenva (massif du Mont Blanc). A: scars (thick lines) and tracks (thin lines) of the rock avalanches of the 19 November 1920 (white lines) and 18 January 1997 (black lines); B: 1997 scar on the Eperon de la Brenva (G. Mortara, February 1997); C: 25-m-high ridges of the 1997 mixed deposit in the distal area (E. Dal Molin, 18 January 1997).A : niches d’arrachement (traits épais) et parcours (traits fins) des écroulements rocheux de 19/11/1920 (traits blancs) et 18/01/1997 (traits noirs) ; B : niche de 1997 sur l’Eperon de la Brenva (G. Mortara, 02/1997) ; C : bourrelets de 25 m de haut dans le secteur distal du dépôt mixte de 1997 (E. Dal Molin, 18/01/1997). Fig. 7 – The complex process chain of the AD 563 Tauredunum event, in the Lake of Geneva (modified from Schoeneich et al. 2007). Fig. 7 – Complexité du processus en chaîne lié à l’événement du Tauredunum, 563 AD, qui s’est produit dans le lac Léman (modifié de Schoeneich et al., 2007). A: The process chain leading to the impulse wave; B: Flow chart of the whole process chain. A : Le processus a engendré une onde de choc ; B : Diagramme montrant l’ensemble du processus en chaîne. Fig. 8 – Les Drus rock avalanche of 2005. Fig. 8 – Écroulement des Drus de 2005. A: The west face of Les Drus and the scar of the June 2005 rock avalanche; B: extension of the 2005 deposits (90 000 m2); C: detail of the deposit at the diffluence above the moraine of the Drus debris-covered glacier.A : La face ouest des Drus et la cicatrice de l’écroulement de juin 2005 ; B : extension du dépôt de l’écroulement (90 000 m2) ; C : détail du dépôt au niveau de la diffluence par-dessus la moraine du glacier noir des Drus. Monique Fort, Étienne Cossart, Philip Deline, Marc Dzikowski, Gérard Nicoud, Ludovic Ravanel, Philippe Schoeneich et Patrick Wassmer, « Geomorphic impacts of large and rapid mass movements: a review », Géomorphologie : relief, processus, environnement, vol. 15 - n° 1 | 2009, 47—64. Cambridge University Press, 2016, 324 p.
Springer International Publishing Switzerland, 2016, 270 p.